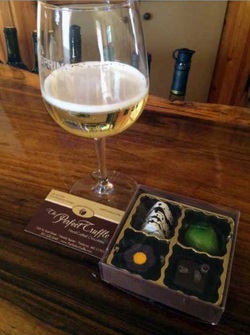 A Spring Gate Chocolate Truffle Pairing event consists of a 60 to 90 minute pairing of four truffles from "The Perfect Truffle", of Frederick, MD, with four of our wines. It will be hosted by one of our trained staff, and will delight those who want to try some of the hundreds of combinations that are available with the palette of truffles and wines. While we won't force you to make a "risky" pairing, we certainly hope you will come back and take some risk with perhaps, a Wasabi Truffle with our Riesling. More gentle and equally delectable pairings can include the Peach Brand Truffle with our Apple Wine. 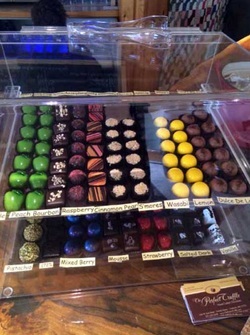 We will host our Chocolate Truffle Pairings in two locations, "after hours" on certain weekdays in the Tasting Room, and on the weekends in the Adirondack Great Room in the building adjacent to the Tasting Room. It in itself might be worth doing the tasting to see. - In the Public Tasting Room (Buy tickets in the Tasting Room during business hours).